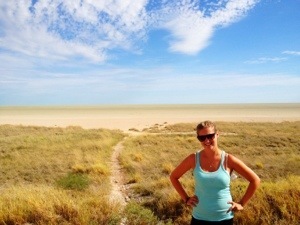 It was a 10 hour drive from the Delta to our campsite near Etosha National Park. Even though we knew this, we thought having drinks at the bar the night before was a good idea. When someone suggested shots, we also thought it was a good plan. Then when pulling an all-nighter was laid on the table, Kelsi, Gina and I were definitely in. We sat at the bar, went swimming, played our new favourite Afrikaans song “Maybe Baby” about 100 times, and partied with Sean and Nick, two of the guys that ran the campsite, until our breakfast call at 5:30 the next morning. The 10 hour bus trip was excruciating. We kept pointing blame at each other: “did you suggest shots last night?” “Why would we decide to stay up ALL night? !” We did a lot of napping during the first half of the trip. We also did a lot of itching. Kelsi and I had been bitten by bugs so many times while we were in the delta that our legs looked like they’d been through a war zone. We probably had 30ish bites on each foot alone: Mosquito bites, ant bites, and caterpillar rash covered our bodies. We slathered on this silver ointment that Gina had, but to no avail. We tried tea tree oil, an aloe itch relief gel, and anything that people could offer to help. In the end, only scratching our bites until they bled gave any sort of satisfying relief. 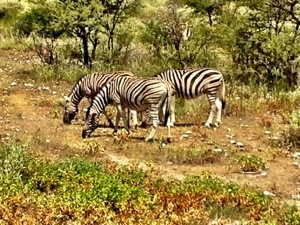 We were almost too distracted with the scratching to see any animals on our Etosha game drive. Being our 9th or so game drive on the trip, we were not overly impressed by seeing an impala on the side of the road. 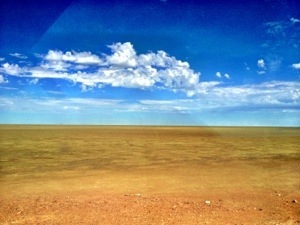 But the animal sightings picked up when we came across our first watering hole. 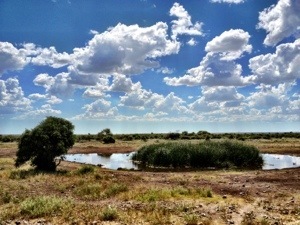 The watering holes are where the action takes place. The first one we pulled up to had a tonne of animals. There were a huge herd of impalas, an oryx or two, a bunch of zebras, about 15 giraffes, and a pride of 8 lions hanging out in the trees a few meters away. They were all so close to each other it was possible to fit them all in a single camera shot! 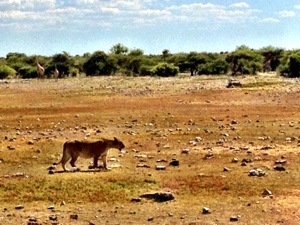 As soon as we arrived, the lioness got up to have a drink of water. 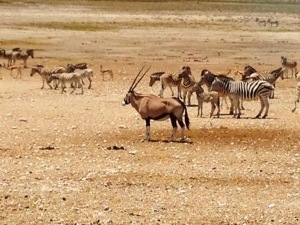 You could see the rest of the animals tense up. The impalas shuffled the other direction, the giraffes stood still and followed the lion closely with their eyes. The zebras ran in a frenzy to the other side of the watering hole, then every eye in the area was intently watching the lioness move towards the water. 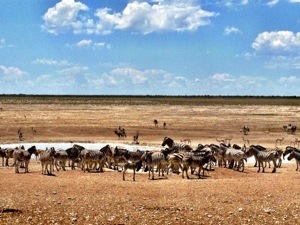 She lapped up water for a few minutes, with the whole animal kingdom watching, then stalked her way back to the shade. Just a few moments later an elephant came walking towards the back of the bushes where the lions were relaxing. This was where we got to see who the real king of the jungle was… Turns out both elephants and lions are scared of each other. The elephant jumped back in surprise when it came around the bushes, face to face with 8 lions. The lions were equally shocked to see a full sized elephant sneak up behind them and ran to the next tree grove. The animal kingdom still stared, alert and ready to flee! 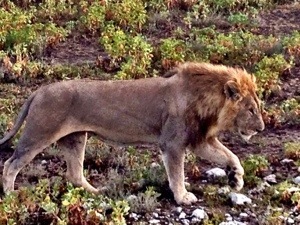 The only animal un phased was the male lion. He sat his ground and simply lifted his head when the elephant went past. What an exciting afternoon at the watering hole! Eventually, the elephant washed himself in the water and we drove onwards to camp. Just before dinner that night, it began to rain. Kelsi and I, worried about our tent, frantically tried to pull it under the cover of a tree and save our bags. It was just a little rain, under the safety of a tree, what could go wrong?! 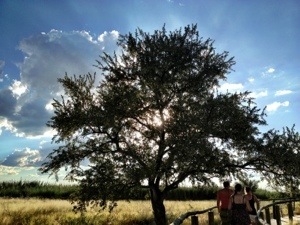 So remember in Vic Falls, when we picked out the most dilapidated looking tent we could find? 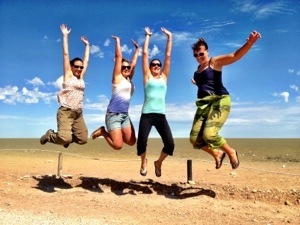 Well this finally caught up to us big time in Etosha. When we made it to our tent, the walls were saturated with water. The floor had small puddles around the sides and drips were falling from the ceiling. We took our towels and mopped up what we could in the tent. The rest we wiped down with wet wipes and crossed our fingers that the rains wouldn’t come back in the night. Then we went to sleep. It didn’t take long before the rains started up and the water came dripping into the tent again. The bottom half of my body had a steady drip and my feet were sitting in a puddle. Kelsi had it worse… “I’m gettin’ it in the face, Hairy!” She announced. At first it was funny. We laughed at our sad situation as we felt the drip drop of the rain fall into our laps. Then we nearly hit our breaking point. We’d had very little sleep in the past 48 hours and were getting cranky. The rain soaked our sleeping mats and our wake up time was creeping closer. We contemplated pulling our sleeping mats into the communal bathroom and sleeping on the floor, but it was too much effort. At 5 am we were brooding. This was the worst tenting experience we could think of. When Manda woke us 45 minutes later we didn’t want breakfast and we didn’t want to socialize. We had a cup of tea and took it for a walk to see the sunrise. Screw this day! Luckily, we calmed down a little and had a good long nap on the bus. 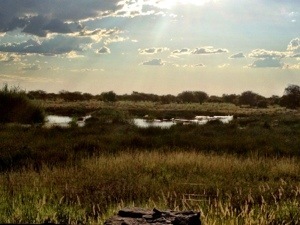 We had another game drive to get through, then off to our next campsite: El Dorado! 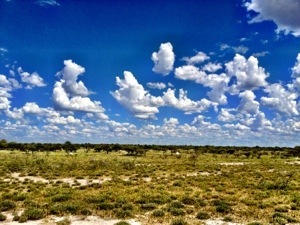 This entry was posted in Africa, Namibia and tagged Etosha National Park, Game Drive, Namibia, Travel by hilarylust. Bookmark the permalink.